This is a small folding silk production box that Qua-Fiki invented to use with his "Bigger" silk production routine. As the kids shout "Bigger" and wiggle their fingers, the silks that Qua-Fiki produces get larger and larger right up to the rousing finale. Two audience helpers examine the empty box and assist with the production of the giant silks. I, Professor Spellbinder, will certify that this Sneaky Production Box is really something new. I have not found anything like it in the literature, although I know where Qua-Fiki "stole" the ideas. He admits he read my research on the Hankerchief Box, and read Jim Gerrish's work on the Chimney Screen, and even got some inspiration from one of my Greeting Card effects. But when he finished roiling them around in his brain, out popped something new in the world of magic. The box is folded flat at the start. There is not room for a tissue, much less a large load of giant silks. All the parts of the box are shown openly and fairly. Yet, when the box is assembled with the aid of two helpers from the audience (who give it a final examination), the silk production proceeds as described, with each silk getting larger and larger. 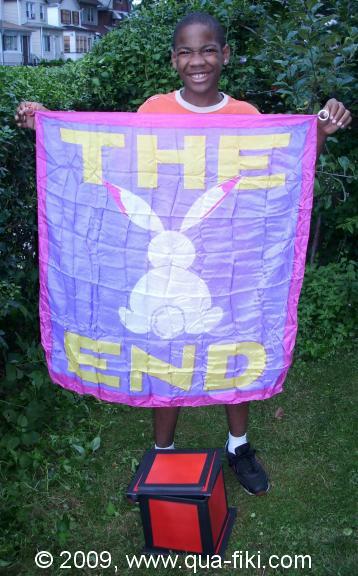 Qua-Fiki finally pulls out a six foot silk from the tiny box, and then produces, as a finale, one more 36 inch THE END silk. 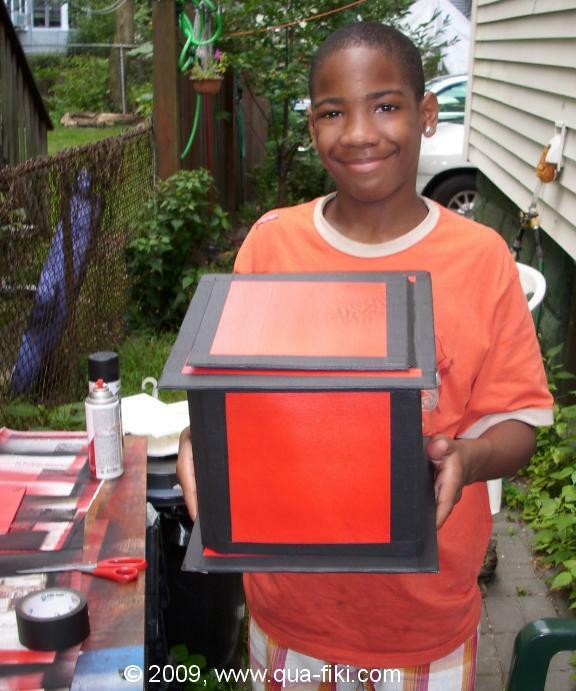 The e-Book shows Qua-Fiki making the box shown above in a single afternoon, from foam board, spray paint and gaffer's tape. The box shown above is an 8 inch cube, which Qua-Fiki feels he can reduce to a six inch cube and still maintain the same size load, with some more work. Just added! Qua-Fiki's variations on his own effect; the Very Sneaky Production Box and the Ultra Sneaky Production Box. The box is smaller ( a six inch cube) and yet holds the same size load as the 8 inch cube. Both versions can be performed entirely in the performer's hands, away from any tables. Purchasers of the e-Book have access to Qua-Fiki's videos demonstrating the Very Sneaky Production Box routine, and a video showing Qua-Fiki's explanations of the handling. The videos are not available to the general public, but purchasers are given private access. One More Time! 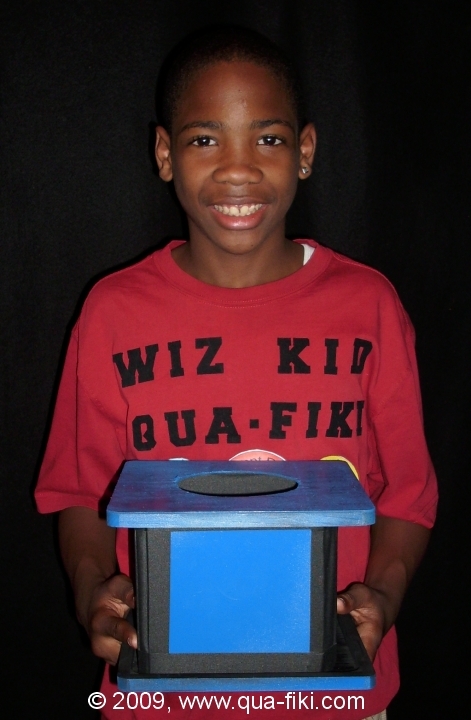 Wiz Kid Qua-Fiki has just reinvented his Sneaky Production Box! This time it is called the Flippy Floppy Sneaky Production Box and it's even better than before! The video below shows the new box in action! Remember, you get all four versions of Qua-Fiki's Sneaky Production Box in this one e-Book. YOU decide which one or ones you want to build and use for your own special situation or show. WJ18-00 COMPLETE - 246 pages!